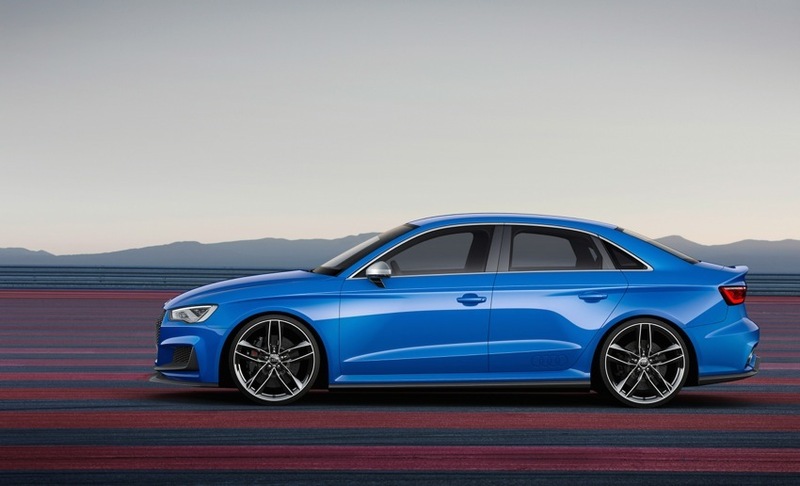 The Audi S3 Saloon surrenders to the Wörthersee treatment this month, swapping its already potent 300PS output for a mighty 525PS and metamorphosing into the A3 clubsport quattro concept for the annual meeting of fans of the Volkswagen Group brands in Reifnitz, Germany (May 28-31). Adding 600Nm of torque to the mix courtesy of a 2.5-litre, five-cylinder TFSI engine which replaces the S3 Saloon’s four-cylinder TFSI, the A3 clubsport quattro concept will be the Audi star of a show that will also include the 420PS Audi TT quattro sport concept and a host of other Audi models. “The Audi A3 clubsport quattro concept shows our car and tuning fans at the Wörthersee just how much sporty potential there is in the A3 family and in our top‑of‑the‑line engines such as the 2.5 TFSI. We have pushed the limits in every respect with this show car: power, dynamics, sound, design,” says Prof. Dr. Ulrich Hackenberg, Member of the Board of Management for Technical Development. The powerful five‑cylinder TFSI engine is already available in the first ever SUV to wear the renowned RS badge – the RS Q3. The turbocharged engine with direct injection boasts an impressive CV – since 2010, it has been voted “International Engine of the Year” in its category four times in succession. In the show car, the 2,480 cc five‑cylinder unit has a specific output of 211 PS per litre, and combined with a kerb weight of 1,527kg the power-to-weight ratio of the concept stands at an impressive 343.8PS per ton. 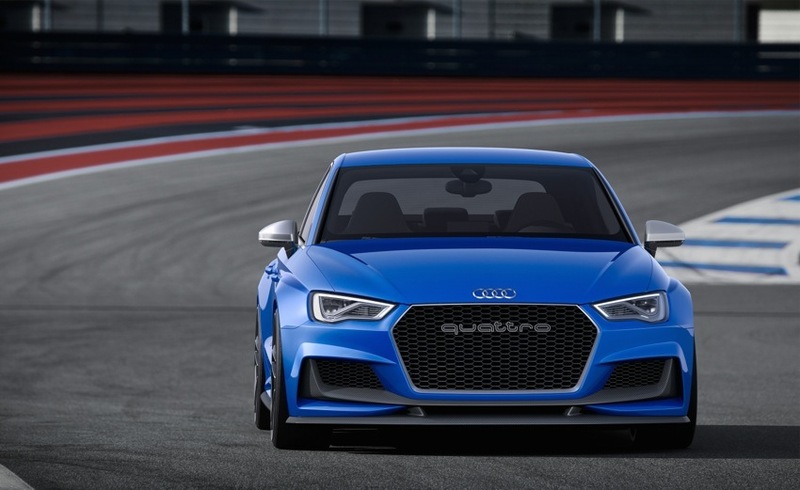 The 600 Nm (442.5 lb‑ft) torque peak is available between 2,300 and 6,000 rpm, pushing the A3 clubsport quattro concept from 0 to 62 mph in 3.6 seconds on the way to a top speed of 192 mph. Extensive modifications make this extreme performance possible. These include a large turbocharger with up to 1.5 bar of relative boost pressure and a modified intercooler. The basic concept behind the five‑cylinder already makes it a special engine. 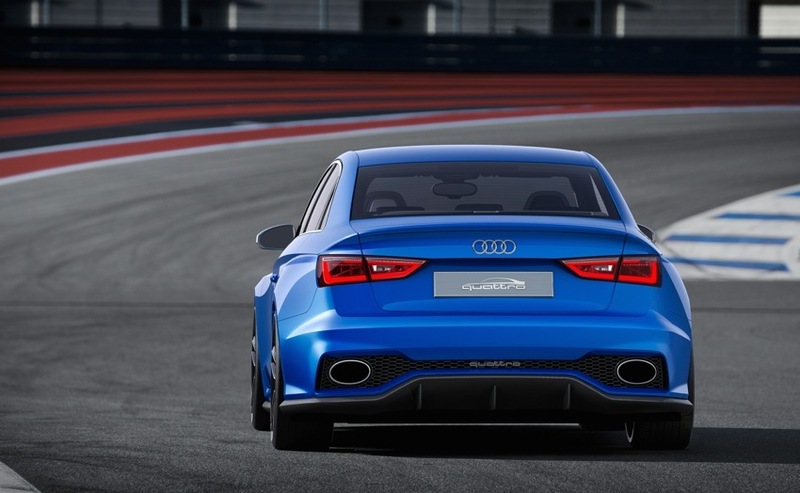 The 1-2-4-5-3 ignition sequence gives it its own unique rhythm, which in the A3 clubsport quattro concept is reinforced by an intake and exhaust system designed for maximum throughput. The characteristic sound of this TFSI engine is a throaty snarl. In addition to its distinctive sound and technology, the 2.5 TFSI also looks stunning set beneath its carbon fibre-reinforced polymer (CFRP) bonnet. 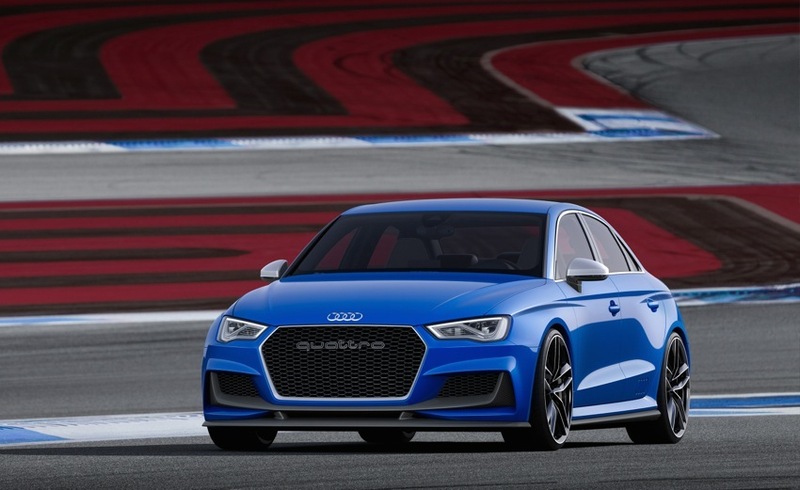 The Audi A3 clubsport quattro concept features a seven‑speed S tronic transmission with a compact three‑shaft layout. Its tall seventh gear reduces fuel consumption, and the final gear ratio has been modified accordingly. The driver can allow the dual‑clutch transmission to work fully automatically in modes D and S or choose to change gears manually using the paddles on the steering wheel or the shift lever. A launch control function manages starts with maximum power and controlled wheel slip. The heart of the quattro all‑wheel drive system is a hydraulically activated, multi‑plate clutch on the rear axle that has been specially designed for the high torque of the powerful five‑cylinder. Like the engine management system, its electronic controller is integrated into the Audi drive select driving dynamics system for the best configurable dynamics in any situation required by the driver. The clutch can direct a portion of the torque from the front to the rear axle if the driver turns sharply into a corner. Its advanced chassis enables the Audi A3 clubsport quattro concept to deliver its tremendous power to the tarmac with impressive control and composure. Aluminium components in the front MacPherson suspension reduce the weight of the unsprung masses. The four‑link rear suspension can process the longitudinal and transverse forces separately. The steering rack of the progressive steering system is designed so that the steering ratio becomes more direct with increasing steering input. In addition, steering boost decreases as speed increases. 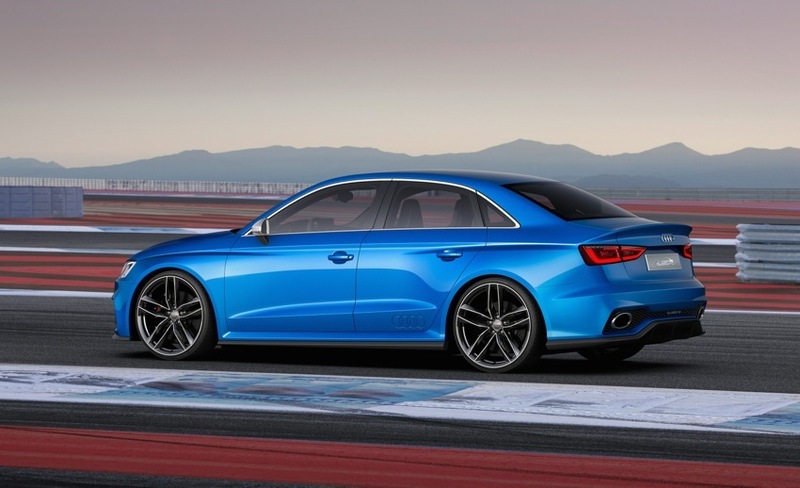 Compared to the production Audi S3 Saloon, the body has been lowered by 10 mm and spring and damper settings have been adjusted to suit the increased performance. All three parameters can be adjusted via the struts of the coilover suspension so that the show car can be perfectly adapted to the task at hand, be it on the road or the race track. 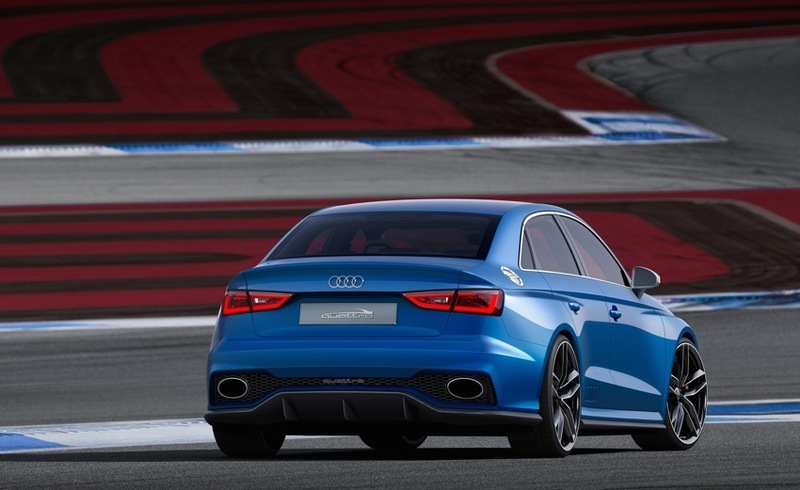 The Audi A3 clubsport quattro concept rides on 9.5 J x 21 wheels shod with size 275/25 R21 tyres. The internally vented front brake discs measure 370 mm in diameter. All four discs are made of carbon fibre‑ceramic, making them extremely lightweight and abrasion-resistant. The ESC electronic stabilisation control, which can be partially or completely deactivated, supports the show car’s responsive handling with lightning-fast reactions. At the cornering limit, torque vectoring via brief applications of the brakes of the inside wheels ensures that the Audi A3 clubsport quattro concept turns easily into the corner. It enables maximum mid-corner adjustability, with the front axle straightening the show car out again as it exits the corner. The Audi A3 clubsport quattro concept is based on the modular transverse matrix (MQB). This enables a low centre of gravity and a finely balanced distribution of axle loads, which is a prerequisite for the car’s handling ability. Hot‑shaped steel components in the floor of the passenger cell form a strong structure. The extreme strength of the steel allows for thin walls and thus very low weights. The spectacular appearance of the Magnetic Blue body immediately conveys the dynamic potential of the Audi A3 clubsport quattro concept. The Singleframe grille up front is framed in matt aluminium. A quattro badge adorns the grille’s high-gloss black honeycomb insert, which has been optimised for high flow. The bonnet, whose front edge extends slightly over the grille and the LED headlights, sports the four rings. A distinctive element at the front of the show car is the continuous blade of exposed CFRP below the Singleframe grille. Like the winglets on a model aeroplane, its ends are bent upward to structure the large air inlets framed in massive edges. As with a racing car, a splitter at the bottom of the front skirt increases the downforce on the front axle. The side view of the saloon has also gained some sharp accents. Two straight edges above the wheels that end in the doors frame the wing and the rear sidewall. The “blisters” give the body broad shoulders while also evoking the classic quattro models from Audi and the current RS 4 Avant. The round fuel cover in the C‑pillars and the more compact side mirrors are further typical Audi sports car elements. The side sill trims are made entirely of CFRP (carbon fibre-reinforced polymer). At the rear, a large diffuser that extends upwards in the middle makes a bold statement. Three fins divide its high-gloss black honeycomb insert; two additional grilles joined by a blade conceal the tailpipes of the exhaust system. When the driver of the Audi A3 clubsport quattro concept applies the brakes at high speed, the air brake is activated. Electronically actuated, the rear segment of the boot raises from its standard spoiler setting to a near-vertical position in the blink of an eye. At 155mph, the air brake reduces the stopping distance by around twelve metres, in part because the ESC can allocate more braking power to the rear axle thanks to the increased downforce. The cabin of the Audi A3 clubsport quattro concept seats four comfortably. Racing seats with high side bolsters await the driver and front passenger. The backrests are open-worked below the integrated head restraints and CFRP shells cover the backs – a visual expression of Audi’s lightweight construction concept. Black faces, red needles and white numbers define the look of the instrument cluster. A shift light in the rev counter indicates when the rev limit of 6,900 rpm is reached, and the seven‑inch monitor of the MMI navigation plus system displays a special graphic when the engine is started. Two large, separate buttons on the three‑spoke, multifunction sport steering wheel are used to start and stop the engine as well as to choose Audi drive select modes. Black is the dominant colour in the show car’s interior. The upholstery features light grey piping and contrast stitching in Sepang Blue. The headlining and the pillars are covered in black Alcantara, and the decorative inlays are brushed aluminium. Fine details emphasise the performance potential of the Audi A3 clubsport quattro concept. The footrest and pedals are made of stainless steel; two open-worked bars form the handles for the door openers. The selector lever of the seven‑speed S tronic transmission sports a red ring, a CFRP badge and a clubsport logo. The show car’s name can also be found on the instrument cluster and on the door sill trims. This year’s motto at the Wörthersee meeting is “Audi Sport,” and the Audi stand has been transformed into the Audi Pit Lane. 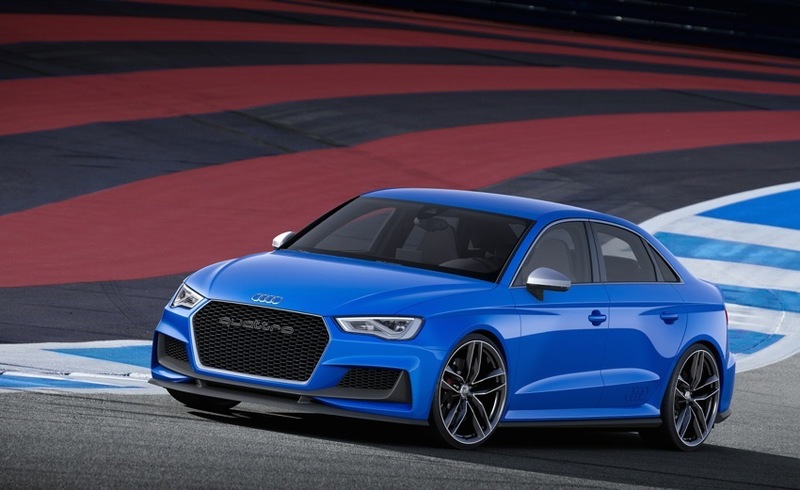 In keeping with this, the A3 clubsport quattro concept is joined by a familiar sports car from the line of show cars and ten additional high-performance models from various vehicle classes.